Instead of buying expensive, fresh corn in your grocery store, grow your own nutritious crop in your backyard. Being able to harvest the corn on the day you eat it can help you enjoy the sweet flavors of this plant in a whole new way. The corn stalks are voracious feeders. To ensure proper corn ear development and plant growth, provide your corn with the proper soil-borne nutrients via well-timed fertilization applications throughout the growing season. At the time of planting, add an application of fertilizer to give the future seedlings the nutrient-rich soil bed that they need to experience maximum development and growth. Having a strong start can make a big difference when it comes to stalk size, disease-resistance and ear production. In most cases, using 1.5 to 2 lbs. of all-purpose, balanced fertilizer like a 12-12-12 product for every 50 square feet of gardening space will suffice. The act of mid-season fertilization is known as sidedressing. By this time, the corn stalks will have exhausted the nutrients supplied during the initial fertilizer application. This second dose will give them the nutritional boost they need, especially as they enter the flower- and ear-growing stage. Once the stalks are approximately 1.5 feet high, apply 1.5 tbsp. of 10-10-10 fertilizer for every 5 feet of growing rows. Sprinkle the fertilizer evenly and then water immediately to carry the nutrients to the corn's root level while also minimizing your chances of "burning" the base of the corn stalk. While not always traditionally viewed as fertilizer, organic mulches -- applied in a 1.5- to 2-inch layer once the corn's four to five inches tall -- serve several fertilizing roles. First, they slowly decompose and help fertilize the underlying ground with soil-conditioning matter and micronutrients. Second, they help the soil conserve water, thus keeping the thirsty corn plants happier. Third, they minimize the impact of weeds, which rob the corn of its nutrients. Finally, they prevent soil erosion and the accompanying leeching of soil-borne nutrients. Compost or aged manure is advisable to add during the fall once the corn is harvested and the plants plowed under. This fertilizes the soil and also enriches, aerates and conditions it for next year's spring growing season. Use 2 to 3 inches of compost and mix it in to a depth of approximately 6 inches. This annual application helps keep your garden space in tip-top shape, whether you grow corn again or move on to another vegetable or fruit. 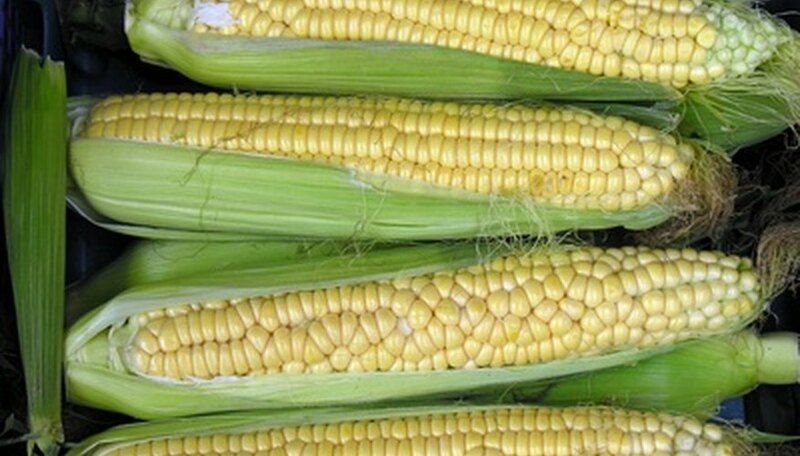 How Does Sweet Corn Pollinate? What Kind of Fertilizer Do I Use on Asparagus Plants? Which Fertilizer Works Best for Corn?